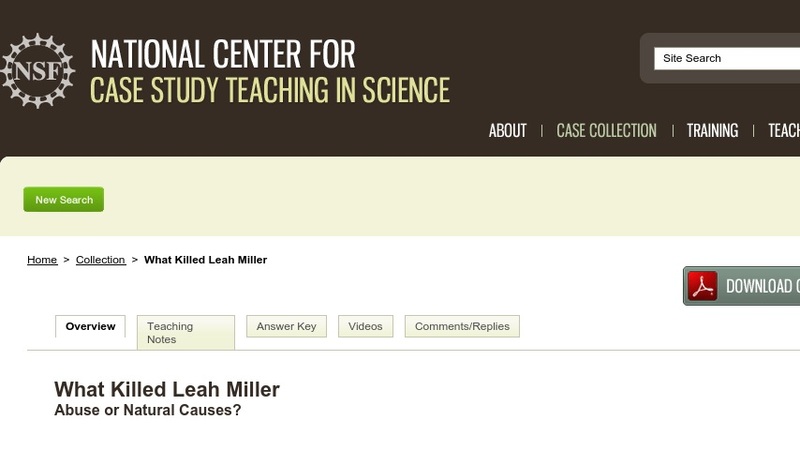 What Killed Leah Miller Abuse or Natural Causes? An Amish infant suddenly dies and law enforcement officials suspect the parents of child abuse. But experts who advocate for the parents argue that an underlying genetic disorder common among the Amish may have resulted in the baby’s death. Students assume the role of a police detective and answer questions regarding blood clotting and shaken baby syndrome. They then piece together their information and decide if the evidence is in favor of the parents or the police. The case was written for a two-semester anatomy and physiology course, but is also appropriate for undergraduate physiology and human biology courses.